ChimneySeal is used as a chemical-resistant membrane or gasket seal for the prevention of water infiltration. 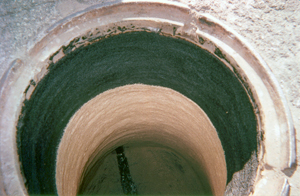 Sauereisen Manhole ChimneySeal No. F-88 is an elastomeric lining composed of fiber-reinforced, asphalt-modified urethane. ChimneySeal is used as a chemical-resistant membrane or gasket seal for the prevention of water infiltration.